It is inconceivable in many ways that we would have to even argue and debate whether or not Israelis could live in Israel, not just in parts of Israel but anywhere in Israel they wished to live. Settlements on land conquered and occupied by Israel in the 1967 war are considered illegal under international law, and U.S. administrations have consistently held that continued settlement construction negatively impacts the prospects for a peace agreement between Israelis and Palestinians. ‘How many years can a man turn his head and pretend that he just doesn’t see’? In the case of the dictatorship in Egypt, it was 30 years. Thirty years of relentless support for a regime contrary to the very principles of the governments that supported them. From a report in today’s HaAretz; Israel called on the United States and a number of European countries over the weekend to curb their criticism of President Hosni Mubarak to preserve stability in the region. Preserve stability? Don’t they mean preserve tyranny? 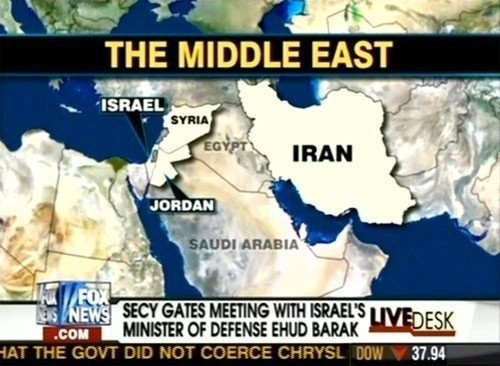 Israel has been content with Mubarak’s government, they were able to control their every move. Now they are worried that without Mubarak, the ‘stability’ might change to reality. The reality of a new government that supports the rights of the Egyptian people as well as the Palestinian people rather than one that has been cooperating in keeping both of them down. What I am saying is that America’s support for Egypt over the past 30 years was not actually support for Egypt, it was support for Israel! Egypt has been a loyal friend of the zionist state for decades, Israel has done everything in its power to garner support for them from the West. 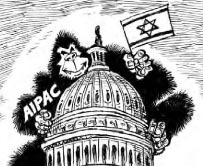 AIPAC has done everything in its power to make sure the US stands by them! The tables are turning and the truth is coming to light. 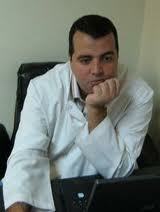 Egypt’s greatest fear at the moment is that the truth might actually set its people free. To prevent this from happening, they shut down the Internet a few days ago, they booted out Al Jazeera. It seems their intention is to prevent the world from seeing what is going on there today. This might have been possible in the days of the Pharaohs, but not today! It’s game over for dictatorships! It’s game over for governments that supported these dictatorships! There’s a new game on the horizon, it’s called PEOPLE POWER! No one can stop that from happening and America’s incongruous Congress better wake up to that fact. They helped get the Egyptian people into the mess they are in today…. it is they that must help get them out of it! The following skit from Saturday Night Live is meant to be funny (which it is), BUT…. it’s very close to the real picture. Unfortunately, too much of the world is laughing at the situation while the people of Egypt are crying out for Freedom…. Speaking today in a series of television interviews, Secretary of State Hillary Clinton reiterated that the Obama Administration does not seek and would not support the ouster of Egyptian dictator Hosni Mubarak. Rather, she insisted that the US wanted Mubarak to listen to those opposition figures who have “legitimate grievances” and move towards a “managed change” and an “orderly transition” toward a somewhat more democratic society. Clinton even disavowed previous suggestions that the US might revoke its military aid to Egypt, what with the Mubarak regime using its security forces chiefly to kill dissidents, insisting that the US didn’t want to be seen as “backing away” from their long-time ally. A group of former officials, however, are urging the US to cancel the aid for the time being, insisting that they cannot possibly expect to be seen by the protesters as “neutral” when they are throwing $1.5 billion annually in support at the regime. A More Accurate Map Illustrating the Conventional Location of Egypt. The Arabic news channel Al Jazeera is owning the coverage of the unprecedented uprising happening right now in Egypt. 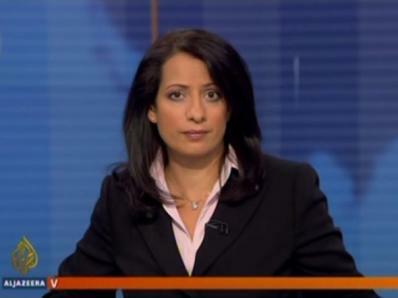 Amazingly if you’re in the United States you can probably see Al Jazeera English online. Twitter has been full the last day or so of people sending links to various live streams and apps that allow you to do just that. As reported in the NY Times yesterday, Al Jazeera’s coverage over the last 15 years has helped to build a narrative regarding about everyday Arab suffering. Since we’re just becoming familiar with them, and the whole world is watching, we thought you might want know more about the news anchors of the moment. Security was deteriorating across Egypt late Sunday as protesters mounted fresh marches and rallies in a number of cities. In Alexandria, protesters marched around barricades meant to keep the streets clear, Al Jazeera reported. “This protest, this march, has been going on for seven hours now. Clearly, no sign that it’s going to abate any time soon,” an unnamed Al Jazeera correspondent said. Meanwhile, pundits and bloggers debated what role the Arab satellite news network has played in the political uprising. On CNN’s Reliable Sources, Howard Kurtz spoke with Al Jazeera’s Washington Bureau Chief Abderrahim Foukara about Bill O’Reilly’s recent comment that Al Jazeera is “spurring on this revolt and encouraging uprisings all over the Muslim world.” Foukara disagreed. 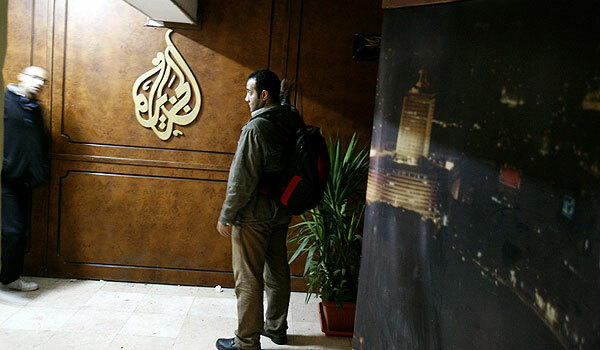 “The viewership, the people who are directly involved in these events, they come to Al Jazeera because that’s who they feel they can trust with their grievances and their aspirations,” Foukara said. Many academics, bloggers and other outside observers agree, saying Al Jazeera, which has English as well as Arabic-language channels, has evolved to play a similar role in this conflict as CNN did during the Persian Gulf War in 1991. But so did bloggers and those with Twitter feeds such as “Sandmonkey,” who sent dispatches Sunday as he arrived in Tahrir Square (“in tahrir now, everyone here, ppl of ALL classes, army letting us in, v peaceful”) protestst grew tense (“word is army has permission to shoot live ammunition at protesters”) and he left for Zamalek (“zamalek is a ghost town, inadequate protection even by volunteer committees”). But Marc Lynch, an associate professor at George Washington University, credited Al Jazeera — more than Twitter and other social media— with fostering recent uprisings in Tunisia and other countries. Gamal Nasser, a spokesman for the Brotherhood, told DPA that his group was in talks with Mohammed ElBaradei – the former UN nuclear watchdog chief – to form a national unity government without the National Democratic Party of Mubarak. The group is also demanding an end to the draconian Emergency Laws, which grant police wide-ranging powers The laws have been used often to arrest and harass the Islamist group. 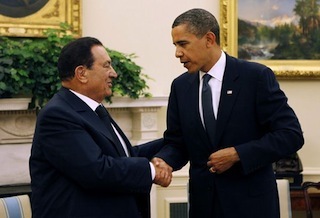 Nasser said his group would not accept any new government with Mubarak. On Saturday the Brotherhood called on President Mubarak to relinquish power in a peaceful manner following the resignation of the Egyptian cabinet. Speaking to CNN later Sunday, ElBaradei said he had a popular and political mandate to negotiate the creation of a national unity government. “I have been authorized — mandated — by the people who organized these demonstrations and many other parties to agree on a national unity government,” he told CNN. “I hope that I should be in touch soon with the army and we need to work together. 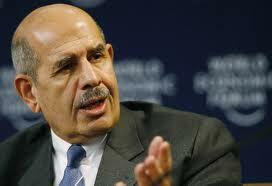 The army is part of Egypt,” the opposition leader added. Opposition figure Mustafa el-Naggar stated that ElBaradei “will be joining protesters in Tahrir,” adding he would come to the square later on Sunday, his first visit to the hub of the protest since returning to Egypt on Thursday. The Egyptian cabinet formally resigned Saturday at the command of Mubarak, following violent anti-government protests that have now reached their sixth day unabated. Mubarak has yet to comment on the cabinet’s resignation. The embattled president addressed the country on Saturday for the fist time since the riots began, saying that he had no intention to resign. The protests are the most serious challenge to Mubarak’s 30-year authoritarian rule. The embattled president defended the security forces’ crackdown on protesters, but said that he will press ahead with social, economic and political reforms in the country. Groton – Connecticut National Guard Detachment 2, Company I, 185th Aviation Regiment of Groton has mobilized and will deploy to the Sinai Peninsula, Egypt, to support the Multinational Force and Observers. Chief Warrant Officer Four James Smith of Ivoryton commands the aviation unit. Is Food the Central Theme for Mass Uprisings? U.S. exercise in crowd control. Notice the “Food Now” sign. After the 30-year reign of Hosni Mubarak of Egypt, severe poverty seems to be a driving force behind the massive uprising in the last six days. Without food, it seems the people had no choice but to take to the streets and demand an equitable solution. A similar event is anticipated in the United States. 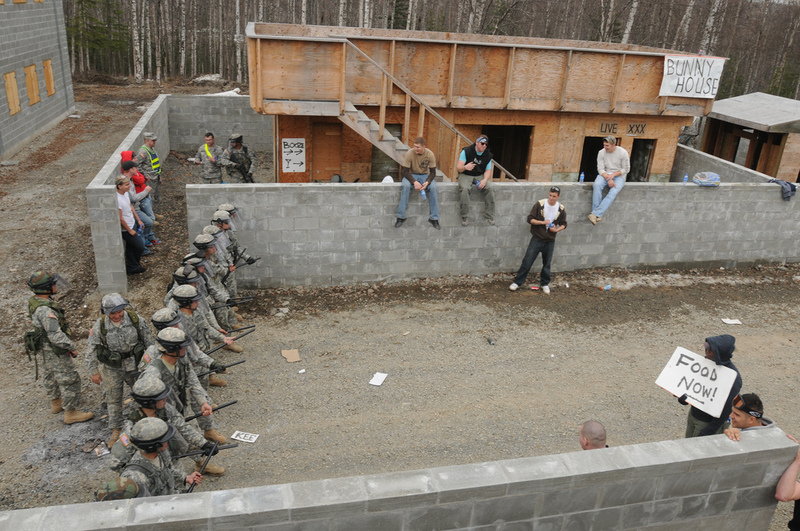 Above, Army National Guard troops conduct an exercise in crowd control and identify the perpetrators as those demanding food. Will a shortage of food be the primary motivating factor for an uprising in the United States?